I took this photo this morning at Saint Germain at the Café Bonaparte. Of course it's a little too much (too typical, too French, too blue, white, red!) but it's kinda cute ;-) I searched the web and found out that the first café appeared in Turkey in 1554 and that the first European one opened in 1615 in Venice. Paris had to wait until... 1643! Of course now we also have Starbucks LOL! Maybe the best thing is that it's exactly at Saint Germain: the church, the place. And it looks like they renovated the windows. Very nice. Oh: bien sur I voted for your blog. Very interesting that the awning has the colors of the flag of France. Every day I see the flag of France, because here in Brazil I work by the French Consulate. Greetings from Roberto, Rio de Janeiro. I love the colors and if I were in Paris, I would never step foot in Starbucks. Well, as for this traditionalist, there's no such thing as too typical - especially when its this sweet. It just makes me long all the more for my tootsies to be touching down in France. I can practically smell the crisp fall air with aromas of coffee and croissants wafting above the mist coming off the Seine. Wish I were out for a long walk out in the morning dew (yes, Jeff, that was a nod to you!;). I love the lighting on this picture - you can imagine what is casting the shadow over the awning. Beautiful woodwork on the windows, too. The weather has been amazingly warm here and in Paris too looks like. Thanks Eric! 1615 that is so old Cafe. loves to see that and the colors of shelter looks a lot like Britian flag. Great photo Eric...Paris looks lovely right now...and of course I voted for your blog(tried to vote twice on the IPad but no go)hope you win!! 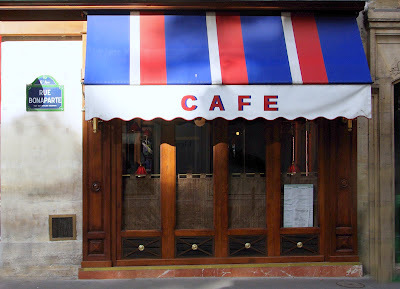 When I lived in the 12eme(many long years ago)there was a cafe similar to this downstairs and the owner used to cook sausage every morning...loved it, the last time I was there it had closed and I think they retired...so sad. I don't go to Star*ucks in SF, why would I go in Paris?? Oh, maybe to get a frappuccino for Michael and Roniece...LOL!!! Cute little postcard kind of shot! This image is looking very pretty. It is a good job. What perfect symmetery! So simple, lovely. This says it all! My vote is in for you! Oui, oui! I would love this cafe! I have been to Starbucks exactly 3 times in my life. Can't say I'm missing anything. I would much rather go to our local coffee house where they roast their own beans! It is amazing and now I'm really craving a Gingerbread Latte. (With Monin syrup!) :) Have a great day! Gorgeous! Why, oh why, can't I be sipping my morning coffee there instead of at my desk in New Mexico? Vote cast for the best blog in the world. You can keep your Starbucks and give me too too typical French any day! I think it's perfectly charming, Eric. This cafe is really very very cute. The whole area where it´s located is lovely. I´m impressed by how long cafes can last in Europe. I remember being at Cafe Florian in Venice in complete awe when I found out it exists since 1720!! If you want to know everything about cafés - much more than in my small caption - pay a visit to French girl in Seattle, it's impressive what she's done. @Tonton " I don't go to Star*ucks in SF, why would I go in Paris?? Oh, maybe to get a frappuccino for Michael and Roniece...LOL!!!" Tell me about it! I only have one thing to say...Do they serve frappucinos here? Thanks for the tip of French Girl in Seattle blog!!! Its really a good post to make a look into it.Its really very much impressive too.